Taoiseach Leo Varadkar has spoken of his fear that people could be found “dead in their homes” in isolated areas in the coming days as a result of the weather. Mr Varadkar also conceded that there could have been “a risk” to the food supply chain had the severe weather event of recent days been more prolonged. However, Leo Varadkar said there is “no need for panic buying” of food amongst the public because the supply chains are clear. 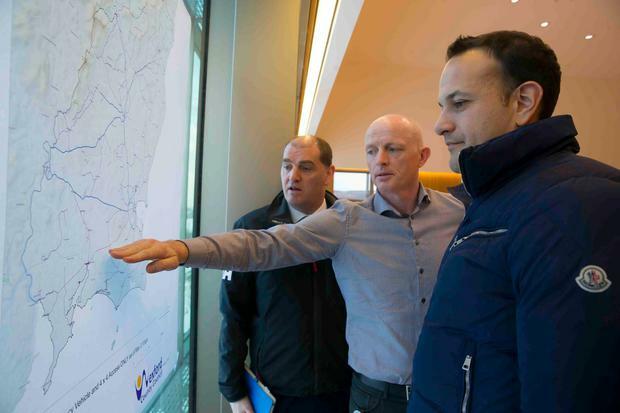 Speaking during a visit to Wexford today to meet some of the people working on the frontline to alleviate the effects of the snowstorm and its aftermath, Mr Varadkar paid tribute to the efforts of all of the state agencies involved as well as volunteers who came together to help others. Asked if he was concerned, given the dwindling of fresh food supplies in many shops during the second half of last week, of the effects on food stocks of a longer severe weather event, the Taoiseach said: “There is no need for panic buying, the supply chains are clear and the various different suppliers are able to get food to the supermarkets so there is no need for panic-buying. I really want that message to get across. “It was different in different places but once the storm ended it was possible to clear the main roads. The priority when it comes to an event like this is to make sure the roads are open to the hospitals, to the garda stations for example, and also to supply chains. Mr Varadkar pointed out that there have been a number of road fatalities in recent days although it’s difficult to know if they were caused by the weather. “But there have been a number of deaths, sadly, and of course there is the possibility that as we clear the roads as we get out to isolated areas, that we may find people dead in their homes in the coming days. The Taoiseach said that in the last few days we had witnessed “the full force of mother nature, the worst snow storm in 35 years” and while most areas are returning to normal, the worst affected parts such as Wexford, west Wicklow and north Kildare will have the resources of the rest of the state put into them to help with the clear-up. Mr Varadkar visited Wexford general hospital and also the local ambulance base during the evening and spoke to staff and volunteers about the weather event. Earlier, he met at Wexford County Council’s headquarters with representatives of various agencies such as the gardai, the council, the HSE, the hospital, civil defence, fire service, defence forces, and ambulance service. Dressed casually in blue denim jeans, a blue t-shirt and sweatshirt and a navy “zippy” jacket, he was accompanied during the visit by ministers Kevin “Boxer” Moran and Paul Kehoe and greeted by CEO of the county council, Tom Enright. At one point, garda Chief Superintendent John Roche said that an upside to the weather event had been the lack of crime as the criminals couldn’t move around. “They managed to get around in Dublin,” the Taoiseach interjected with a smile, prompting general laughter in the room. He appealed to the public to conserve water, be careful on the roads and on the footpaths, and only use hospital emergency departments in genuine emergencies.